eos (HarperCollins), New York, 2005. 305 pages. Available at Sembach Library (J MCN F NIX). 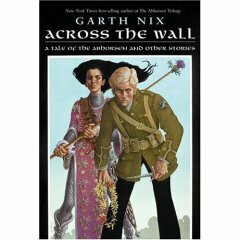 I was delighted to find another story by Garth Nix set in the Old Kingdom, taking place after Sabriel and Lirael and Abhorsen. The title story is more of a novella, and tells us what happens to Nick Sayre, recovered from the events of the previous book and living back at home in Ancelstierre. He wants to get back to the Old Kingdom. He wants to see Lirael and Sam again. When his uncle invites him to a mysterious house party, to meet the head of the government’s spies, he’s told if he cooperates, he can get a pass to cross the wall. However, he isn’t prepared for the horrible thing he finds at the house. The remaining twelve stories are all haunting, powerful and magical. The variety yet consistent quality is impressive. I often get tired of reading anthologies and have to read them slowly. This one, however, compelled me to continue on as each story was so excellent, I wanted to read another.